How your team pulls flags can make for enjoyable Saturday game of football or frustrating pull your hair out kind of day. More times than not, wins and losses in flag football will come down to the team that minimizes mistakes on flag pulling and whether or not the first defender makes the tackle. Because of this, I devote at least 20 minutes of practice to flag pulling (most of my practices are an hour long). With younger teams, the tendency is for runners is to get to the sideline once someone gets in their way. 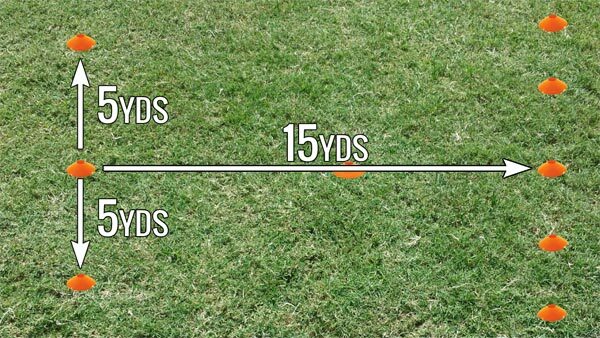 Because of this, working on flag pulling while chasing down the sweep is a drill I run every practice. To set up this drill, I use 9 cones. One marks where the center would be snapping the ball. There’s no center in this drill, the cone is just there for reference. Place another cone down 5 yards behind the line of scrimmage and another 5 yards beyond the line of scrimmage. This is where the offense and defense will line up. The offense is in a running back position and the defense is in a middle linebacker spot. You may be tempted to add additional things to work on such as QB handing off the ball and even Center/QB exchange, then handoff and run. 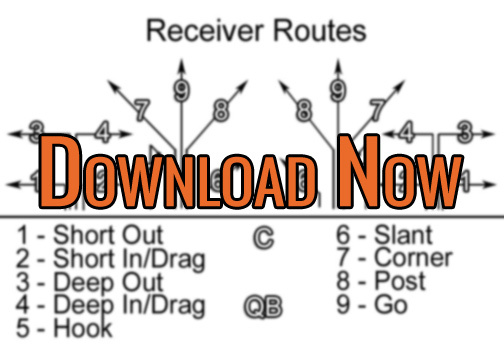 However, keep in mind that these additional things will slow down the drill as you’ll get fewer reps of flag pulling. To make the drill mimic a game situation, I place the sideline cones about 12-15 yards from the where the offense and defense are lining up. Many times, coaches will work with a smaller field in practice. Once in the game, the kids’ timing is off as there’s more ground to cover. 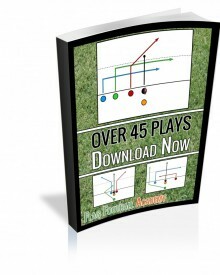 Place a couple cones on each side of the line of scrimmage to designate the sideline. After you have the sideline cones down, you’ll need to place one more cone to mark where the offense is allowed to start their cut back (if they want to). They cannot cut back behind the cone but can cut back and advance as long as they are beyond the line of scrimmage. Next, split your team into two groups of offense and defense. If possible, give everyone in the offense line a football. I like using footballs as much as possible in this drill as it gives the kids experience carrying the ball. It will also give to some insight to how they will run with the ball and whether a player has the tendency to flag guard a little which you can correct in the practice versus taking a penalty in the game. On your “GO!”, both the offense and defense sprint toward the sideline. The offense can cut back anytime once past the first cone. The defense is trying to pull the flag. If the defense does get beat, it cannot be up the sideline. Stress to the defense that they must force the offense back to the middle of the field. Try to get your offense to just flat out sprint and beat the defense up the sideline without any moves. As the kids become more familiar, I move the defensive starting point so they have further to run. This will teach the defense to find the right angle of attack as the defense may have to run backward a little to cut off the sideline. You may have kids that still try get to the defense as close to the line of scrimmage as possible. However, with the longer run, the offense can just outrun them and get up the sideline. Another variation I frequently run is adding another defender and is farther back and away from the sideline. The teaching point here is hammering home that the first defender cannot get beat up the sideline. He must force a cutback. The second defender cannot get beat up the middle. This teaches the players to work as a team and corral the running back. Starting out and with younger kids, I would frequently run this drill 15-20 minutes in the practice putting in some variations. After about 7 minutes of the offense running to the same side, have the offense and defense line flip sides. Now, the drill is set up for the opposite side. If you have a big group of something like 8 or more, you can speed up the rotations by having the drill set up to both sides of the field. You can send the first group to the one side and once the flag is pulled send the next group to the other side. You’re running the second while the first group is still handing back flags and exchanging the football. Once the second group is done, the other side should be cleared out and ready for the third group.